Regal and rich in symbolism and delight, the color purple has always evoked images of luxury; and Teleflora''s Purple Reign flowers are no exception. This striking bouquet - with its blend of purple, lavender and green blossoms - would make a remarkable gift for a birthday, anniversary or for anyone who loves purple. 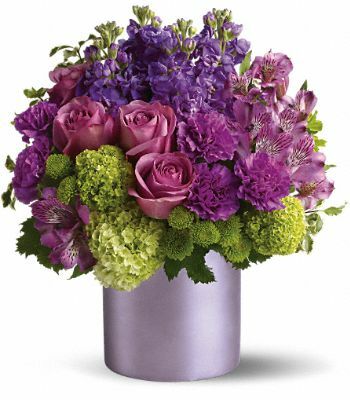 A mix of fresh purple, green and lavender flowers such as roses, stock, carnations and button spray chrysanthemums is delivered in a purple Teleflora Satin Collection Cylinder.